Gujarat Infrastructure Development Board (GIDB) has published Advertisement for below mentioned Posts 2018. Other details like age limit, educational qualification, selection process, application fee and how to apply are given below. 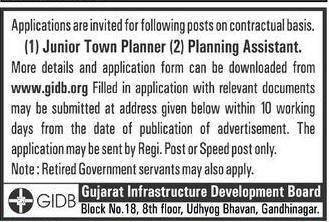 Have at least 2 years of post qualification experience of Town Planning and Urban Development sector. Possess basic knowledge of computer application and should be conversant with Auto-Cad. Not be more than 30 years of age. Possess a Bachelor’s Degree in Architecture or in Civil Engineering or should have Bachelor’s Degree in Planning recognized by ITPI or other equivalent qualification of any recognized University. a) This appointment is temporary on the purely contractual basis for a fixed period and at the end of which the same shall stand terminated unless extended. b) These posts are based at the office of ‘Town Planning Officer’ of Special Investment Regional Development Authorities. The post includes field job. c) Terms of Service would be as per the contract. d) Age criteria for retired Government Officers can be relaxed. e) Remuneration will be commensurate with qualification and experience.